A family run Yorkshire Wolds business have launched a new traditional product with a twist and perfect for time strapped foodies. 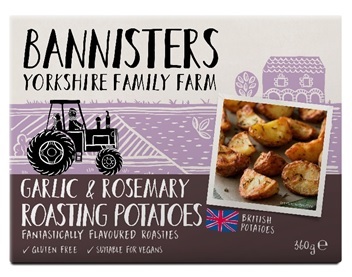 Bannisters Yorkshire Family Farm based in East Yorkshire have launched their tasty Garlic & Rosemary Roasting Potatoes which can be cooked from frozen and taste as good as cooking from scratch. The farming family has perfected a way of roasting the finest British potatoes, cooking them in their skins in locally sourced Yorkshire Cold Pressed Rapeseed Oil together with the classic flavour combination of garlic and rosemary before freezing them to lock in the flavours and textures of home cooked roasties. Fluffy on the inside, crispy on the outside, the new product will be available from Ocado and can be cooked straight from the freezer making them a store cupboard essential. A perfect accompaniment to a traditional family Sunday Roast, and in particular a traditional Easter lunch to go alongside spring lamb, the new product which are gluten free, contain no allergens and are suitable for vegans, make a tasty and easy side dish to liven up a weekday supper and offer a convenient, wholesome and hearty option.